Does your baby have a teething rash? If so, what can you do to make it go away? How can you soothe your baby's pain and when should you go to the pediatrician? In this article, I'll help you figure it all out. I experienced baby drool rashes with all of my kids. I'll discuss how to know if your baby's rash is from teething, 16 incredible prevention tips, and the most popular remedies to try. Your baby is teething, has a drool rash, and is in pain. You want to get your little one back to normal as soon as possible. You've tried a few things, including getting the right chewing toys for teething, but they still have a rash from drool. The first thing you need to find out is if it's teething that's causing the rash or is it something else. Can Teething Cause a Rash? Definitely. The most common is a rash from drooling a lot. However, there are a lot of different types of rashes that your baby can experience. Another common rash during teething is diaper rash (is it related? find out here). If you're a visual person, here's a great visual guide on common rashes and their causes. How Do I Tell If My Baby Has Teething Rash? The first thing to figure out is if your baby is actually teething. 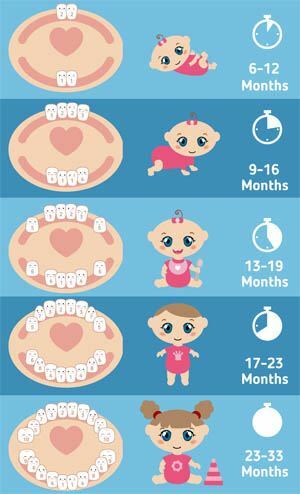 Typically, your baby won't start teething until they're 6 months old. However, it is possible to see a tooth start coming in as early as 2-3 months. If your baby is less than 6 months old but drools alot, they can still develop the same type of baby rash from drooling. In essence, a drooling rash is the same as one caused by teething, as drooling a lot is the source of irritation. When did your baby's rash appear? At the same time that they started teething? Also, is your baby experiencing other symptoms of teething? A common symptom of teething is drooling (it's what causes the rash). Some of the other symptoms include biting, chewing on things, rubbing their face, irritability, refusal to eat, crying, short term diarrhea, night waking, teething rashes on face, and possibly even mild fever. 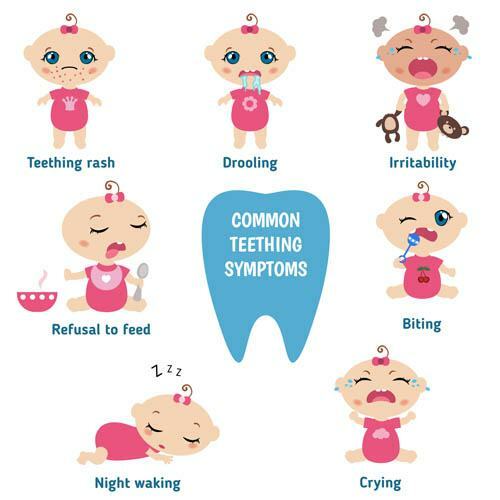 If your baby is experiencing several of these symptoms, especially the drooling and biting, and they have a rash, it's probably caused by teething. 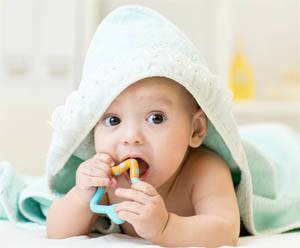 Keep in mind the symptoms of teething are typically very short. If your baby is experiencing symptoms longer than a day or two, it could be something else. Baby teething rashes on the face appear very similar to other rashes. They usually appear as red bumps or splotches. You may also notice some chafing or chapping. Red cheeks during teething is pretty common. It's also common to see a baby teething rash on chin. Typically, the rash will occur anywhere that drool is pooling or staying. It's common to see a teething rash on the chin, face, cheeks, neck, and even the chest. Teething rashes on the body can appear differently than a teething rash on the face or a teething rash on cheeks. So don’t be surprised if your child’s chest and face rashes look different from one another. Chest rashes from teething are often very similar in appearance to eczema. In contrast, teething face rashes may look something like intertrigo, or even a yeast infection. A teething rash is simply a skin irritation that develops on a child’s face, chin, neck, or chest during teething. As most of us know, drool seems to get on everything during this stage. This excess of drool means that your child’s skin may be exposed to it more frequently and for longer periods of time. Obviously drool will tend to coat your child’s face. And this can cause a rash on their cheeks or chin. In addition, however, it can also dribble onto their chest or soak their clothing. If their skin or clothes remain saturated for long periods of time, it can cause a teething rash on the body. The biggest contributors to a rash from teething is drool that sits, wet cloths, and friction. If you can limit their occurrences, you can prevent and treat the rash. In addition, if your baby gets a rash, bacteria from their hands and toys can get into their broken skin, making it worse. If your baby rubs her face constantly, it also adds to the irritation due to constant friction and pressure. Teething and rashes typically appear around six months, when many children start teething. However, if your little one drools a lot, a rash can develop before this age. A rash from teething is the same as a drooling rash, as drooling is the primary cause of irritation. So even if your baby isn't teething yet, but is drooling a lot, they can still be experiencing babies rash around mouth. Rashes may appear on and off as your child’s teeth emerge, but they usually only last for a few weeks and are generally harmless. In essence, the symptoms of teething are typically short. However, a rash from teething can take a few weeks to clear up. 1. The golden #1 rule is that clean and dry is the best remedy. However, it must be done in a way that doesn't irritate the skin. 2. Prevent a rash from developing or staying around by gently wiping drool from your child’s face and chest as often as you can. 3. But keep in mind that friction and pressure on skin create irritation. When gently wiping away drool, use a patting/dabbing method. It removes excess drool and also limits the amount of friction from wiping. 4. Use a bib to keep drool from soaking your baby's cloths. I kept multiple clean, dry bibs ready to go when I went through teething with my kids. 5. Don't use soap often on your baby's irritated skin as this can make the rash worse. Warm water works best. When you do use soap, make sure to only use fragrance free soap without any harsh chemicals. 6. Use a mild, preferably unscented, soap during your baby’s bath to keep from irritating any dryness. Pat your baby dry rather than rubbing to prevent any further irritation. 7. Use fragrance free detergent that is very mild. Your baby's cloths might have direct contact with irritated skin and fragrances/chemicals can make things worse. 8. Always change your baby's cloths immediately if they get wet. Wet cloths makes the rash worse. I always had clean, dry cloths ready. Having several bibs makes this much easier as the bib can catch the extra drool, preventing it from soaking your baby's cloths. Bibs are easy to wash/dry. 9. 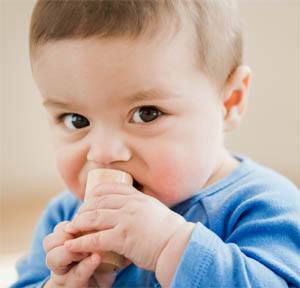 Giving your baby something cold to chew on helps soothe their sore gums. Avoid frozen items though. 10. Use multiple teething toys. You can always have one in the fridge cold and ready to go. The coldness is soothing. 11. Place a towel under you baby when they're sleeping to catch any drool. This can help absorb it so that it doesn't get into their sheets. 12. Use a moisture barrier like Petroleum Jelly, Aquaphor, Lansinoh, Coconut Oil, Aloe Vera, or Vaseline to keep wetness to a minimum. A great natural option is Babyganics Non-Petroleum Soothing Protective Ointment, which is made from seed oil. It can also help relieve dryness, which sometimes occurs with rashes. 13. If you prefer to use a lotion on your little one, ensure that it is unscented. Generally, lotions should not be applied to the rash. It should be kept dry and only coated with the suggested ointments. 14. Watch for any sign of infection. A bacterial infection can lead to impetigo, which is contagious. If you suspect there's an infection, take your baby to the doctor asap. 15. Give your baby extra cuddles when they are teething. They're sore, scared, and want to feel safe. This is one of my favorites! You can use it for multiple purposes. Don’t be discouraged by the word bottom. This ointment can work for all types of rashes on your baby! It's awesome. Yes, that magic stuff that you probably already have lying around the house. It’s great not only for breastfeeding mothers, but also as a moisture barrier for rashes! It also relieves dryness and cracking. It’s completely made from sheep’s wool if you prefer all-natural options. 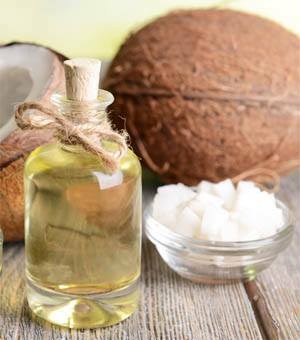 Coconut oil is a great natural ointment to try. This is another great natural option. 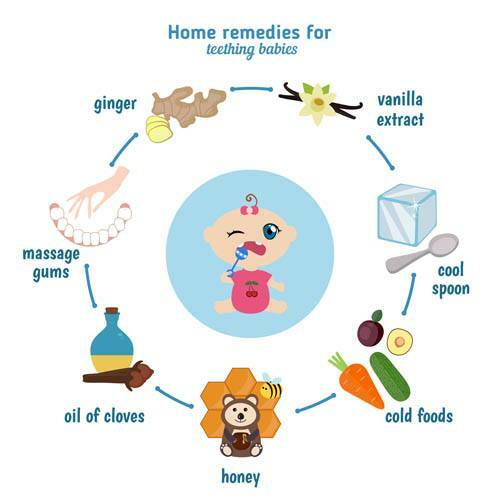 With these tips, you can handle a normal rash from teething with confidence. Of course there are times when you should take your little one to the doctor. If you try the above remedies but find that your child’s rash hasn’t disappeared or improved within a week, schedule a visit just to be safe. Another sign that you should make a visit to the pediatrician is if the rash appears to be infected, is weeping, is cracked badly, or is causing your child any pain. In this case, your doctor will most likely prescribe a stronger cream to help heal the rash and ease any discomfort. Everyone hopes rashes won’t be a common occurrence. Between you and your pediatrician, you can tackle a rash from teething head on. It may seem like a battle in the moment, but the rash will be gone in no time, and your little one’s skin will be glowing once again.